Weekly Discounts for June! Now booking Summer 2019! One Block Back, Is A Newly Renovated Cottage Walking Distance To Long Sands! One Block Back is a 2 bedroom 1 bath condo located just steps from Long sands beach! There is a queen sized bed in one bedroom, a full sized bed in the other bedroom, and a pullout Queen sleeper sofa. This cottage can sleep up to 6 people but is more ideal for 4 people because of the limited living space. The living room, dining room, and Kitchen are all one open space with vaulted ceilings and a sky light. There is parking for 2 vehicles behind the cottage. 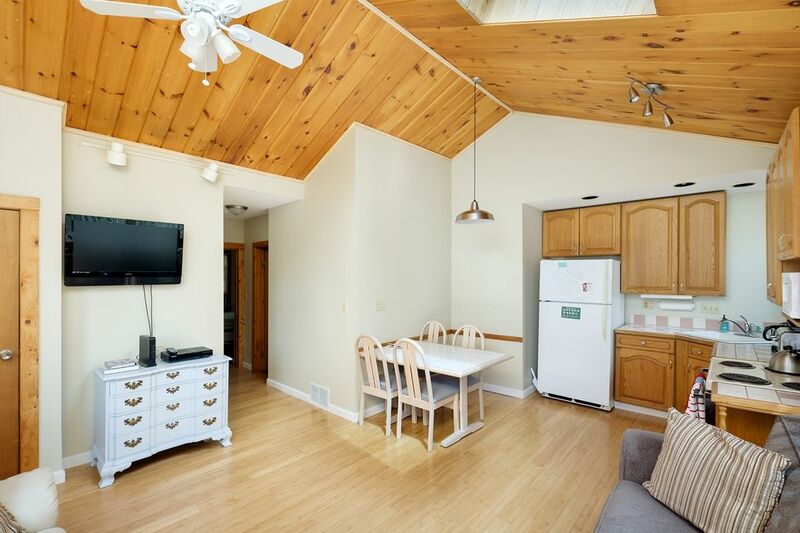 With upgrades like new bamboo flooring throughout, totally new bathroom, flat screen T.V., WiFi, outdoor gas grill, and picnic table, One Block Back is sure to make this year's York Beach Vacation more memorable than the last! Troy and Renee have been interested in Real Estate for most of their lives. Troy made his first investment in Real Estate in High School while Renee was a late bloomer making her 1st Real Estate investment in her first year out of college. Together we like to be creative about ways that we can maximize the value that each of our properties holds and well as create the best vacations for our guest. We have learned so much in the short amount of time that we have owned and managed vacation rental properties but take all of our guest feedback very seriously and ask that guests provide us with private constructive criticism as things occur so that we have an opportunity to remedy the problem in real time instead of retrospectively. We are committed to being in business for the next 60 years and work very hard to host repeat guests year after year! you should have everything you need to prepare basic meals from home, if not I am a call or text away! small front lawn with picnic table and basic lawn furniture. Celebrated my parents’ anniversary with a week at the property. Fully stocked with anything you could hope for, clean, and just a 3 minute walk to the beach! Convenient and comfortable, and very easy to work with! We had the most fabulous week and the house had everything we needed to cook and live comfortably!! Thank you for sharing your beautiful home with my family. The location was perfect for everything we hoped to do!!!! The house was clean and comfortable. We loved being so close to the beach; it is just a 5 minute walk. For the price and the location, this is an excellent choice. The house was very comfortable. Kitchen had everything. The BBQ grill was top notch. Renee made the trip very easy for my family. The binder full of where to go and what to see in York Beach was very considerate and was right on the kitchen table when we got there. York beach is a lovely place. Arcades and lovely general stores and ice cream stands. We were surprised to learn that Long Sands (where the house is) is all rocks by early afternoon. The sand completely dissapears and one is required to open his beach chair upon the stones. Before early afternoon the beach is lovely but the sand is wet and packed save the few yards the town tills nightly. The house has absolutely everything (save linens) a family could need for a beach vacation. The bathroom was large and clean with a low clearance tub. We like to stay active and York is very jogger friendly. All in all our week at the Beach was super enjoyable. The rental was immaculately clean and well equipped for our stay. Beds were comfortable and air conditioner in living area and one bedroom worked fine. Other bedroom had two windows to open to get a cross breeze with a fan provided to give a little more circulation. Neighborhood was quiet. Long Sands beach is a relatively short walk away. Owner were very helpful with tips for the area. Would certainly make a return trip to this rental home. The cottage has a great location just a short walk to the beach and a beach side restaurant. The air conditioners made the hot weather not an issue when sleeping at night. Although half of the house had another unit it was well insulated and we could not hear the other guests. Well appointed with everything you would need to dine in. Thank you for the book with the hikes and things to do in the area! We enjoyed a few walks.